The 1800S by MBM is the new and improved model of the 1500S. The ultrasonic double feed sensor is new to this model. The 1500S could not detect double feeds on black or transparent sheets, but the new 1800S detects double feeds on any white, printed, transparent, black or mixture of colored sheets. Removable folding roller for easy maintenance, the adjustable folding roller pressure, and a spring loaded feed angle adjustment dial. 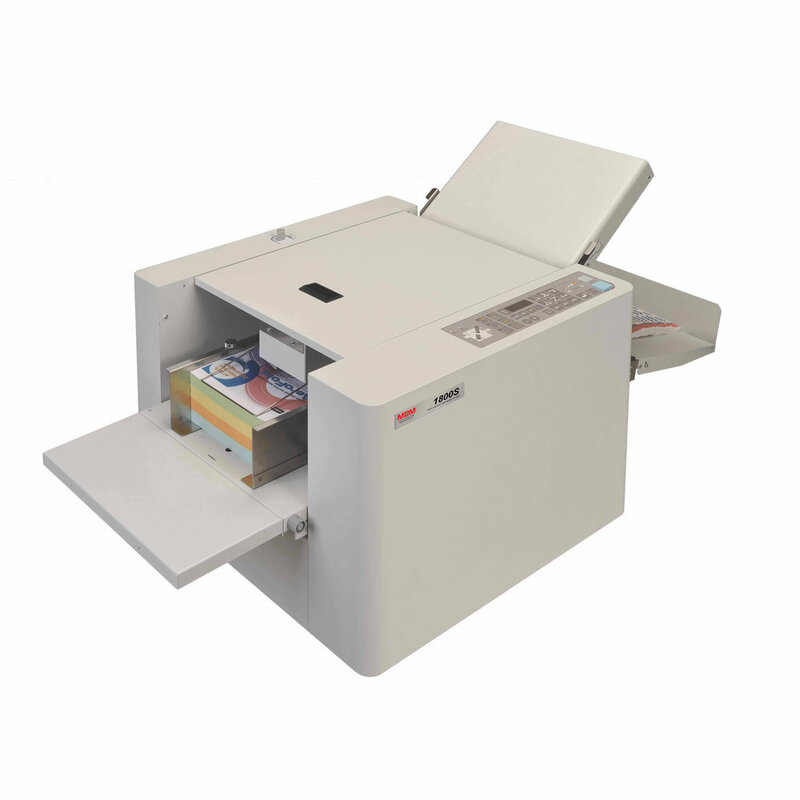 The machine top cover opens and closes in two easy steps and the operator can now reach the air adjustment knob without disruption when the top cover is open. New “silver top” metal sheet for smoother paper run and better electric conductivity. Top feed, adjustable air suction feed system, suitable for digitally printed and coated stocks. Stores 30 custom folds in memory. One-touch memory keys for custom folds. Non-standard paper sizes can be stored in memory. Control touch panel includes 4 digit counter with batch and total functions. Test button folds 2 sheets for inspection. Display alert and audible signal in case of incorrect operation. Skew and micro-adjustment dials. All-metal construction.